Aside from the disruptions that these outages can cause, there is also the possible resultant damage to sensitive electronic equipment, such as hard disk drives and servers, which can cause data corruption and loss. This can pose serious problems, particularly in the Small to Medium Enterprise (SME) market, where the ability to recover quickly from data issues is critical to the sustainability of the business. In light of this, backups are now more important than ever, and with advances in technology, there are backup solutions that make financial sense to the SME. Having an Uninterrupted Power Supply (UPS) installed is only part of the solution, enabling a stateful shutdown of equipment. Backups form the other part of a successful load shedding survival strategy, ensuring that data is always stored somewhere safe and can be easily restored in case of a problem. These five backup tips for SMEs will help smaller businesses protect themselves from data loss and the resulting consequences to business that this can cause. Many Operating Systems (OS) feature standard backup software as part of the package, and these solutions are proven to work. An example of this is Apple Time Machine, a standard backup solution on all Mac computers. They are also an affordable option for the SME market, and do not require much in the way of investment. Purchasing an inexpensive external hard drive to perform backups to will also provide a level of protection. However, this does not necessarily solve the problem of power outages, as external drives often require an external power source. This is where a UPS comes in, as it can be connected to the external drive to ensure it can be shut down safely in the event of an outage. 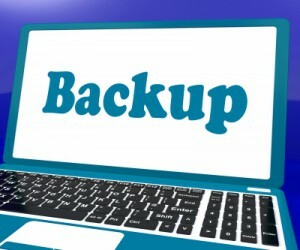 Having one backup these days is simply not sufficient, because of the critical nature of business data and the consequences of losing this valuable information. It is therefore essential to ensure that you have more than one backup hard drive and that these drives are rotated regularly, minimising the risk should one of the hard drives fail. External hard drives are fairly inexpensive, and the initial outlay of purchasing an additional hard drive is minimal compared to the cost should the sole backup drive fail. Rotational backups enable one drive to be kept on premises and another one to be stored offsite. The saying ‘don’t keep all of your eggs in one basket’ is applicable here – there is no point having three copies of your data if they are all stored in one place, as should the office be burgled, or be subject to fire, flooding or other disaster, all copies of the data are likely to be lost. When using rotational backups, ensure one drive is always locked away safely at another site. Another option is to use cloud-based backup solutions. Many of these are available for free, such as Dropbox and Google Drive, which offer a limited amount of storage space, with additional space available for a nominal fee. Once a cloud backup has been conducted, it can then be incrementally updated, saving bandwidth costs. Cloud backups ensure that no matter what happens on site, a copy of data is always stored somewhere else, and can be easily accessed from anywhere using a web portal. Specifically in server environments, it is not only important files and folders that are stored, but also applications, settings and configurations specific to the OS environment. Should the server crash, getting back up and running quickly relies on the ability to do what is known as a ‘bare metal restore’, which allows you to restore an entire computer system. Using bare metal restore capabilities, the backed up data includes the necessary OS applications and data components to rebuild or restore the backed up system to an entirely separate piece of hardware. This ensures that you can get back up and running on new hardware, with a server that is in the original state as at the last backup. Having a backup in place is all very well, but if this backup cannot be used to successfully restore data, it is practically useless. It is therefore important to understand how your backup works, so that you can test to see whether it is being performed correctly and that your data can be restored should this be necessary. One way of doing this is to schedule a routine recovery on the system to make sure that all data is being backed up. Many of today’s backup solutions come with a wizard-drive file recovery for data restoration, however, often restoration is a more complex process, and it is recommended to use your IT partner to assist with advanced system recovery. Time and time again, it has been proven that backups save businesses. The increased risk of load shedding in the coming months highlights this need. When power is suddenly cut, hard drives do not shut down properly, and there is a high risk of the disk crashing and losing or corrupting data. Following these five backup tips will ensure that, in the event of drive failure, data can be easily restored with minimal disruption to business. Aside from the risk of load shedding, having adequate backup is also sound business practice, as disk failure is a common occurrence. No business can afford to be without their data, and therefore no business can afford not to have adequate data backup.